My arms and shoulders were aching. Each stroke of my paddle met with resistance from the wind and the waves, and it seemed as though the beach we were headed for was not getting any closer. Dave was in the front seat, shouting out comments like a back seat driver as I continued to try to steer us straight through the rocky water. "Why aren't you paddling?" he exclaimed when he briefly turned around. "I'm tired! We're far ahead of the group, we can rest a while." Words that my competitive husband loathed to hear. So, we continued paddling against the wind with the pressure of an Olympic rower on my shoulders from my husband up front. We were kayaking through one of the most beautiful places in the world, the Aurlandsfjord in Flåm, Norway. The fjord was stunning - green mountainsides and granite rock cliffs plunged deep into the fjord and the few times the sun peaked out of the clouds it lit up the water. Tiny farms and houses dotted the landscape and sat perched on the hillsides as if a bird simply flew down and found a place to build its nest. It was a peaceful place to be for a day and the Yosemite-like mountains had us reminiscing about our favorite U.S. National Park. Our cruise ship docked in the town of Flam at the end of the fjord. Earlier in the day, our cruise ship docked in the fjord's calm, serene water. As the day progressed and our 1 p.m. kayak tour time approached, the wind in the fjord had picked up and eventually became enemy number one. After a safety demonstration on land from our guide, learning what to do if our kayak flipped, our international group of Americans, Canadians, Brits and Swiss, set out into the fjord to spend a few hours on the water. Our kayaks preparing to be taken out on the water. The wind, combined with larger than desired wakes from other boats, however, set out to challenge our kayaking skills all afternoon. In this otherwise picturesque setting, our kayak rocked up and over the waves, filling the top of my spray skirt and sending water traveling up my jacket sleeves, soaking my shirt inside. Montana, our energetic, Wisconsin-native kayak guide from Njord, led our group of eight along the fjord, telling us tales of the old viking burial mounds along the coastline, the surrounding farms and the legends of the trolls in the hills. We had the wind at our back paddling out from the shore, and even though our four kayaks rocked up and down as we listened to Montana, the paddling was relatively easy. I knew we would dread the moment when we were told to turn around, knowing that the wind had nothing nice in store for us. Our group near the turnaround point. Eventually, after making it past a few points in the fjord, Montana signaled it was time to turn around since kayaking into the wind would take longer on the return. I didn't think we had made it out too far from our starting point, but seeing the cruise ship in the distance upon turning around, I knew we had our work cut out for us. And then my husband became the most demanding coxswain on the water. "Hey, you guys doing okay?" Montana says as he pulls up near us. "Yes, doing fine!" I say as I struggle to keep us headed straight. "Great, lets just wait a bit for the others to catch up." His nice way of telling us to cool our jets and not leave the others behind, a no-no when traveling with a group like this. As we got into our double kayaks earlier that afternoon, Montana called them divorce boats since two people who are not in sync while paddling can quickly become irritated with each other. I wondered if he was checking on how closely we were to calling it quits that day. Soon, the rest of the group was within distance so we dipped our paddles back into the water and pushed on slowly, but steadily. Dave frantically paddled in the front seat, providing a running commentary of us, the made-up Cambodian kayak team, making a break for it and winning Olympic gold in fjord paddling. Luckily for me and our marriage, we were first to reach the beach. We all made it back to shore in one piece, a little wetter than when we started, but with smiles on our faces. Even the wind couldn't ruin the beauty of being engulfed in the fjord for a few hours, from a vantage point that few get to have. Post-kayak and we're still smiling! Flåm is also home of the quaint and rustic Ægir Brewery, which is housed in a large, wooden A-frame building just over the bridge from the kayak beach. The welcoming spot is the best option in town for a post-kayak pint. A pint of porter at Ægir Brewing. Welcoming and cozy spot. 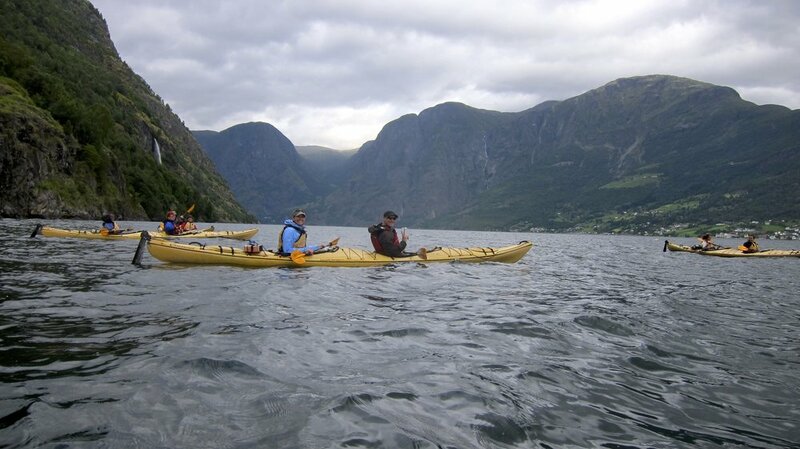 Njord offers multiple kayak trips leaving from Flåm. If you are arriving to Flåm via a cruise ship, check your port of call times to see if you can schedule a trip. The kayak beach is a short 5-minute walk to the cruise ship terminal, making it an easy "do-it-yourself" shore excursion. Booking directly through Njord will most likely save you money compared with the kayak tour options arranged through your ship. The Njord Tours outpost - five minutes from the cruise ship terminal.